I'm not really a flower person, and I never really have been. I grew up listening to my grandad tell me how flowers are a waste of money, as you pay for them and then watch them die. I never really second-guessed that statement really. Sure they are beautiful, and I love wildflowers, but I wasn't really interested in bouquets of flowers - that was until I met Sam's nan. I have never met a person who loves flowers more than her. She loves to be out in the garden planting and growing new things, she appreciates the things I barely noticed. Nothing makes her happier than receiving a bouquet of flowers for her birthday or mothers day. 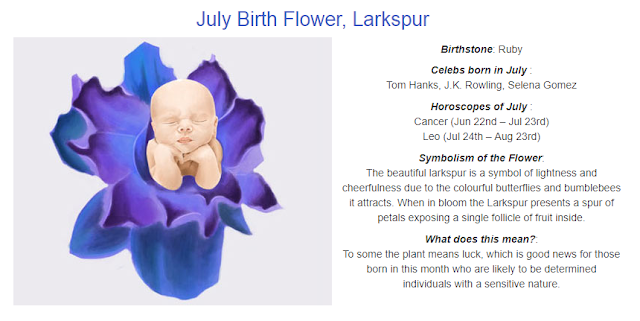 I recently saw an article on the Flying Flowers website when I was looking for a bouquet of flowers for Sam's nan which was all about flower meanings for different months depending on when the person was born, and I found it really interesting. Did you know each month has a different birth flower? I thought that people just brought flowers on appearance, but it is nice to know that there is more to picking a bloom than its appearance. 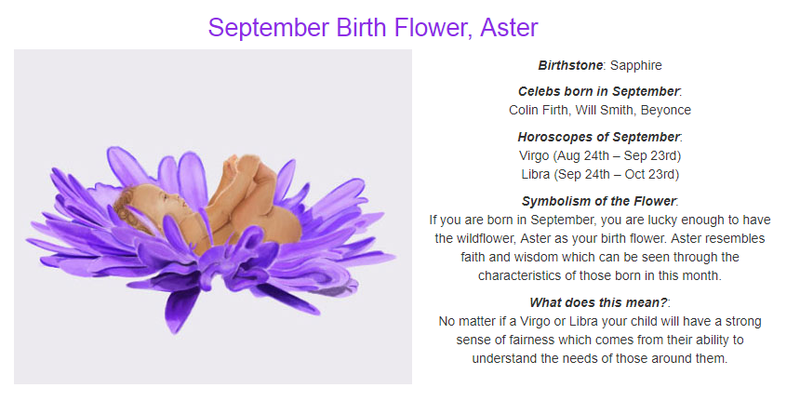 I thought I would share Emily's birth flower, which turns out to be Aster which I didn't even know. 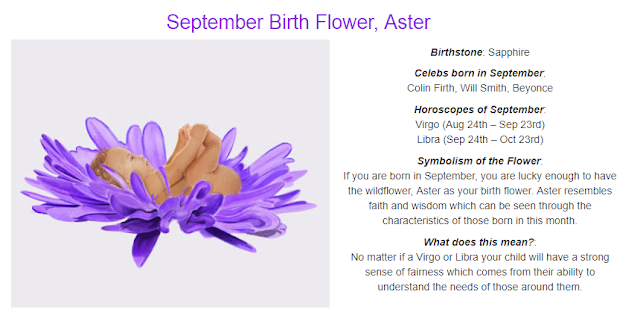 The Aster is a wildflower, it resembles faith and wisdom which can be seen through characteristics of those who are born in that month. I can definitely see those characteristics in Emily. Virgo's horoscope is also on the website, which I also read and seems a lot like my girl. I shared Emily's birth flower so it would only be fair to share Isabelle's which is a larkspur. The Larkspur is a symbol of lightness and cheerfulness which definitely sums up Isabelle. She is always full of cheer and happiness, she wakes up with a massive smile on her face daily. There's no more fitting way to mark an occasion than with a bouquet of flowers. Of course, the bunch you choose has to look stunning but there is way more to selecting blooms than mere appearances. When your choosing birth flowers, you can give extra meaning to this gesture - and maybe it will provide you with some insights into the sort of person that the little one you are buying for will grow up to become. I would love to hear what you think, and if you are a flower lover? You can find out what your child's birth flower is here.